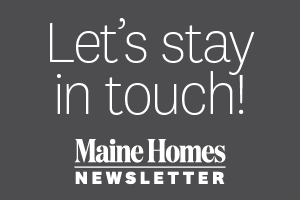 Just 15 minutes from Portland, a home offers a connection with nature from every room. 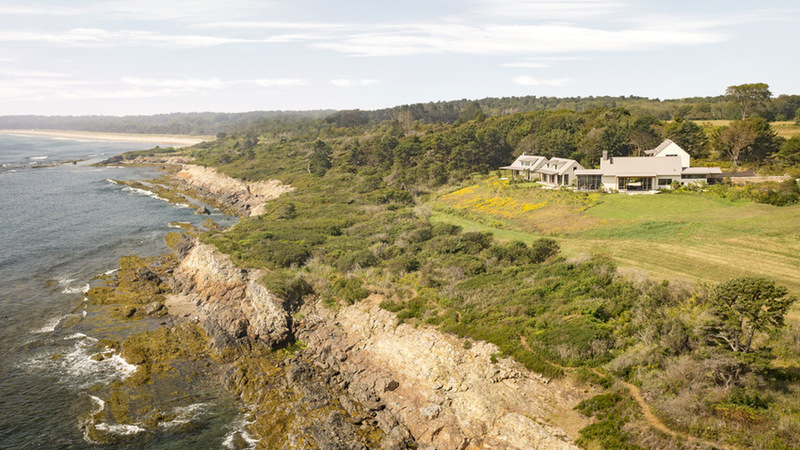 Ocean, sky, wetlands, tidal pools, forest — nature beckons from every room of this custom house on the site of a former saltwater farm. 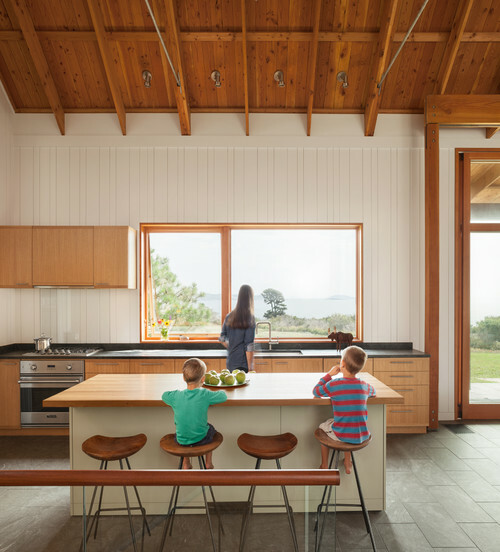 “From the beginning, the clients said, ‘We want this to feel like a summer camp for our kids,’” says Russell Tyson, who designed the home with architect and business partner Rob Whitten of Whitten Architects in Portland. “They wanted a direct relationship with the landscape.” That desire led to a sweeping home spread across the site, with access to the outdoors from every room. 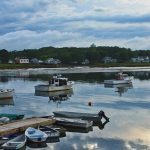 A saltwater farm is a local term for a coastal farm that’s vulnerable to being coated in saltwater by a big wave or storm. Tyson guesses that previous farm owners once grew hay in the large cleared fields. The house comprises two separate buildings. The main building is designed in a V-shape with an open kitchen-living-dining area stretching north and south at one end. At the other end is the bedroom wing. Each bedroom has a large lift-and-slide door leading to a covered porch and a small loft area under a dormer. A car barn is visible behind the main building. A guest room, bunk room, and full bath fill the top floor of the car barn. The 20- by 50-foot living area is meant to feel “like a big tent at the edge of the field,” Tyson says. 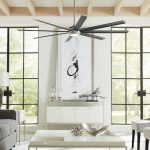 When the large lift-and-slide glass doors are open, rolling screen doors can be pulled across to keep out bugs and squirrels. 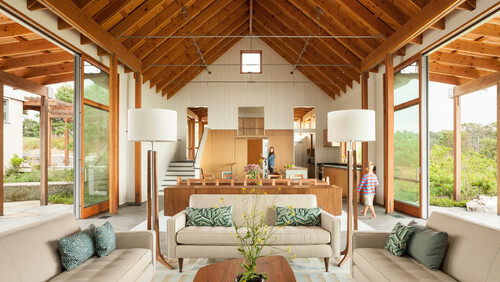 The beams are Douglas fir from the Pacific Northwest; almost all of the other materials are local. 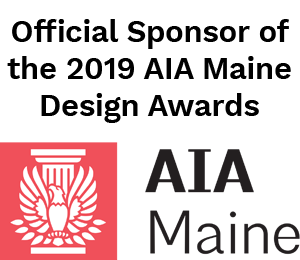 “We don’t have a high-grade wood in Maine that’s as rot-resistant as good Douglas fir,” he says. The half staircase on the left leads to a mudroom (the cubbies are visible through the window above the fridge) and a landing with doors to the car barn and the front of the house. Custom-made white oak planks top the kitchen island. The cabinets are also white oak and the countertops are soapstone. The walls are “nickel gap”— tongue-and-groove boards that leave a gap about the size of a nickel when fitted together. The large window over the sink is stationary and has no sash, which allows for more glass (and a broader view of the water and pitch pine just beyond). The smaller window to the left opens to let in the breeze. “The big idea was to have the main living space fronted on two sides by very different outdoor living areas,” Tyson says. 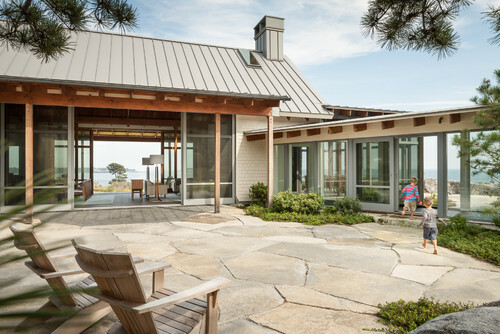 The eastern side faces the ocean, and has sun and wide-open views, while the western side has an intimate, shaded stone terrace. Large pitch pines planted in the courtyard further connect the building to the surrounding landscape. 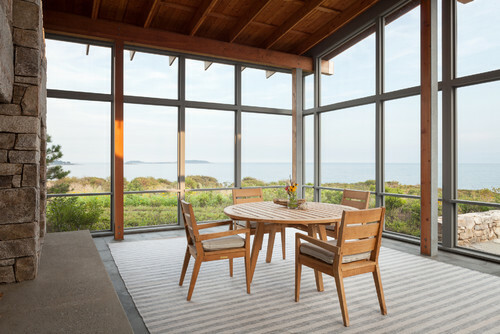 “When you have a house that looks out on the ocean, there can be a significant amount of glare, especially if you’re facing south,” Tyson says. “We wanted to provide light from multiple sides of the room to knock down the glare.” In the master bedroom, a lattice wall allows light to pour in from the dormers above. The stairs behind the wall lead to a small loft study. The flooring is roasted red birch. 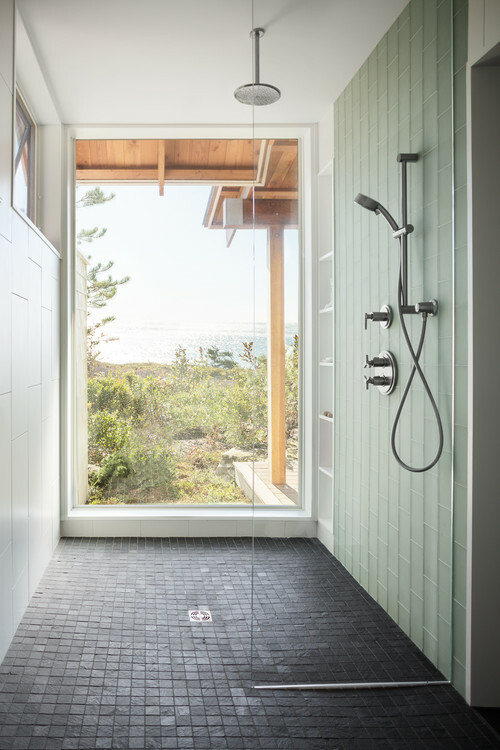 A large window overlooking the ocean fills one wall of the shower in the master bathroom. Plantings outside will grow to partially screen the shower. The floor is slate tile. 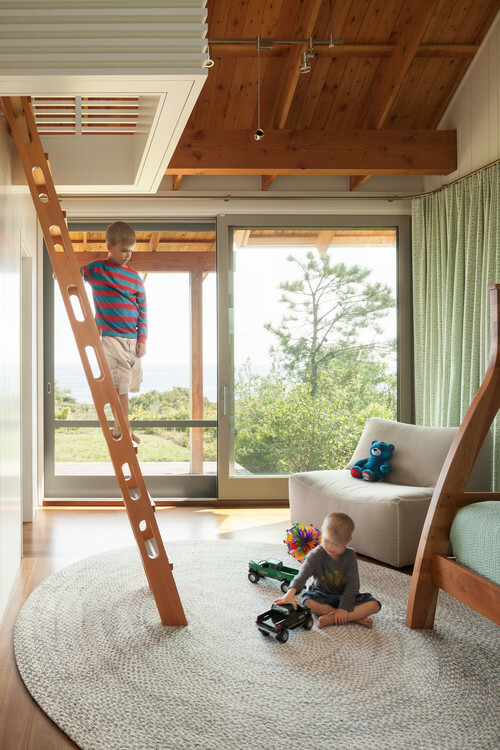 A door in one of the children’s rooms leads to a small, grassy play yard. 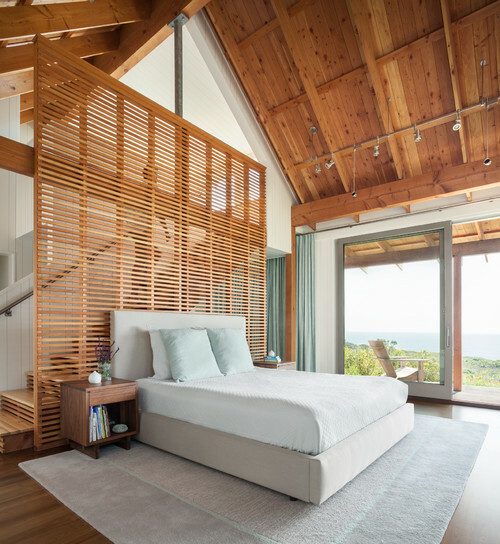 The ladder connects to a little loft with a dormer window overlooking the ocean, a window seat, and storage. “It’s meant to be like a treehouse up there,” Tyson says. “I wanted to create a spot they could retreat to that would be their own intimate space. A place to read a book or watch a boat on the ocean with binoculars.” The two kids’ bedrooms share a bathroom. The screened porch lies at the southern end of the living area. The fireplace wall connects the outdoor and indoor spaces, with hearths on both sides. 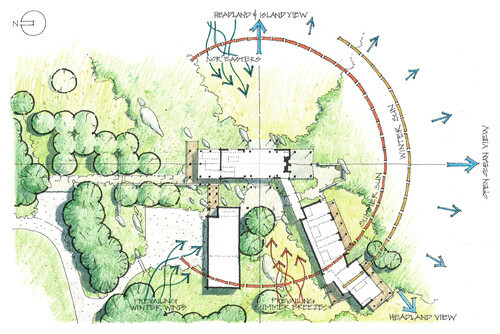 This site plan shows how the designers set the buildings of the house as close as possible to the wooded area to the west. Steve: Your kind comments always brighten my day. Thank you so much taking the time and I’m glad you enjoyed this story. Such love and beautiful planning! A peaceful surrounding to make everlasting memories to treasure! A special place to keep a journal, write a book or love story! to share with my family! Simple yet eloquent!!! !